Fourteen-year-old Nick Gautier has learned a lot about hardship during his short life. He and his mother are barely getting by, and his father is in prison. Nick doesn’t fit in with the rich kids at his posh school, where his classmates constantly taunt him. As if things couldn’t get any worse for Nick, he’s attacked one night by some guys who he thought were his friends and is rescued by a mysterious stranger with almost inhuman fighting skills. Little does Nick know that he’s about to become acquainted with an entire world of supernatural beings, and zombies in particular because his classmates are turning into them. This was the first book that I ever read with zombies in it . . . and I liked it! I don’t watch horror movies because I’m pathetically squeamish, but these zombies were more than tolerable to a wimp like me. But there’s a lot more to Infinity than a football team of the undead. Throw some demons, shapeshifters, and a scrappy hero with razor-sharp wit into the mix, and you have one highly entertaining read. I’m particularly fond of snarky fictional guys; in fact, the snarkier, the better. Nick Gautier’s opening line in Infinity , “I am a socially awkward mandork,” pretty much ensured that we were going to get along famously. And we did. Nick is hilarious, and his nonstop biting commentary was my favorite thing about the book. I even laughed out loud a few times, prompting stares from family members who figured that I’d finally cracked from too much time spent with fictional characters. Anyway, Nick = very funny. This book is teeming with memorable characters, some quirkier than others. On the quirky front, we have Bubba Burdette and Mark Fingerman, supernatural hunters extraordinaire. Bubba owns a computer repair/gun shop, so, as his ad, says, if he can’t fix your computer problems one way, he’ll fix them another (presumably through the use of firearms). In the event of a zombie apocalypse, you want Bubba and Mark on your team. I also loved the demon Simi, who carries a bottle of barbecue sauce and a lobster bib in her purse in case there are any tasty zombies to eat. Simi loves her barbecue sauce! I wish that we’d seen more of Kyrian, Nick’s mysterious savior, and Acheron, the 6’8”, Porsche-driving immortal. I haven’t read Sherrilyn Kenyon’s adult Dark-Hunter series, in which these guys and some other faces from Infinity appear. 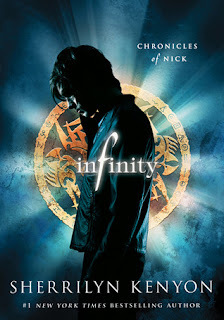 While I wasn’t completely lost as I read Infinity , there were a few times when I felt that some prior knowledge of this world and the characters might have come in handy. With a fairly straightforward plot, Infinity is a light yet fun read, thanks largely to its sarcastic protagonist. If you appreciate the humor of someone like Jace Wayland from Cassandra Clare's The Mortal Instruments or Cassel Sharpe from Holly Black's The Curse Workers , then you need to meet Nick Gautier. And I need to read Sherrilyn Kenyon’s Dark-Hunter series to find out more about Kyrian and Acheron. I’m so happy that I borrowed Infinity and the sequel, Invincible , at the same time. I can continue reading about Nick’s adventures immediately! Well this sounds interesting! Especially since there is an adult Series that goes along with it. many years ago I read this YA series, that ended up developing a spinoff adult series with several of the same characters. I thought it was SO cool! So This is probably pretty cool too. I'm curious about the YA series the was spun off into an adult one. That is a cool idea! I borrowed the first book in Sherrilyn Kenyon's Dark-Hunter series from the library and will be reading it soon. I'm interested to compare it with the YA series. I'm not too sure about such a young character because I feel like I can't connect whatsoever but this one seems to be interesting so maybe i'll check it out. I thought about that too before reading this, but I found Nick to be much wiser (and sarcastic) than his fourteen years. I loved his narrative voice. A football team of zombies? Awesome! I love hilarious main characters so I think I'll go borrow this from my library some time:) Thanks for the review! I liked Invincible even more than I liked Infinity. I finally got Infamous this week from the library- I can't wait to read it!